Hashtag “perfect playlist” is my new thing—whenever I find a worthy collection. 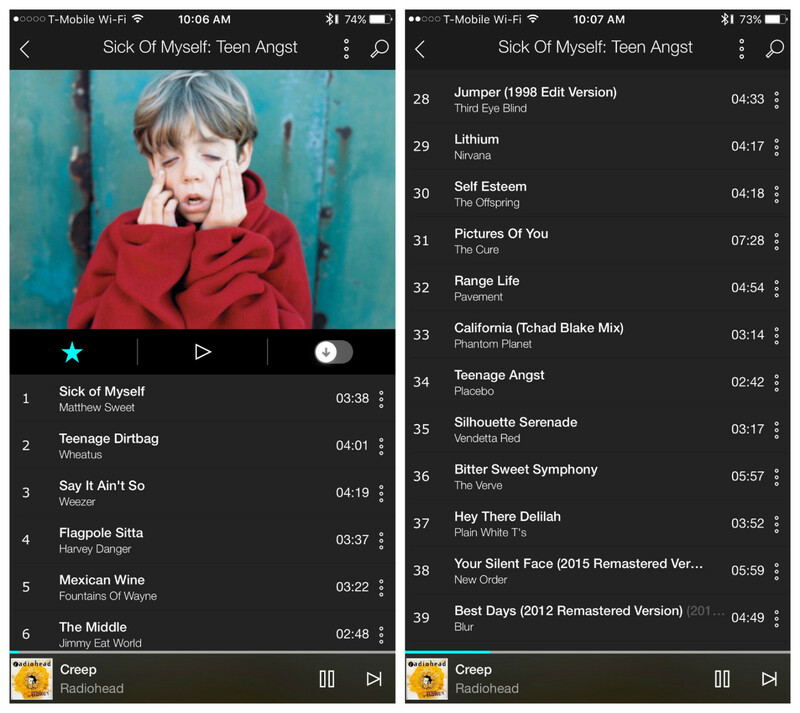 Today’s #perfectplaylist is “Sick of Myself: Teen Angst“, created by Tidal. The mix of alternative and pop punk ballads punctuates one of the reasons I stick with the music streaming service, despite the $19.99 monthly fee (that’s twice Apple Music and Google Music): Fantastic fidelity. I am familiar with most of the 40 songs in the collection—from before subscribing to Tidal 12 months ago. The majority of the tracks sound so much better, I feel like a partially blind man gaining eyesight. (Apologies for mixing metaphor with real sense, but hey.) Some instruments I hear for the first time, booming sense of virgin listening to something thought to be known and familiar. Tidal uses the Free Lossless Audio Codec to deliver music encoded at 44 kHz, 16 bit, and 1411kbps bitrate. Highly compressed AAC tracks from Apple are 256kbps and 320kbps MP3 from most other services. Detail is lost, overall fidelity is muddy, and vocals are garbled (something only understood by hearing the rich pitch from lossless). Tidal calls the codec HiFi, which is about as close to real CD quality as there is commercially available. Among the tracks triggering OMG listening reaction: “Creep”, Radiohead; “I’m Just a Kid”, Simple Plan; “In Too Deep”, Sum 41; “Lithium”, Nirvana; “Mexican Wine”, Fountains of Wayne; “Mr. Brightside”, The Killers; “Self Esteem”, Offspring; and “The Middle”, Jimmy Eat World”. Most every song in the playlist pops, if familiar listening. The genre is punchy and guitars grueling, so I never expected to hear anything much more. But lossless listening reveals quality of the guitar playing, greatly expands soundstage, and transforms presentation of some instruments. The drums are absolutely amazing on “Lithium”, for their forward presence and crisp timbre. I bought Fountains of Wayne album “Welcome Interstate Managers” from iTunes about 13 years ago. “Mexican Wine” was one of my least-favorite tracks; no more. This listening experience comes from the Tidal app streaming on iPhone 6s Plus connected by Bluetooth to Master & Dynamic MW60 headphones, which don’t get the full fidelity available because iOS doesn’t support the Aptx codec.